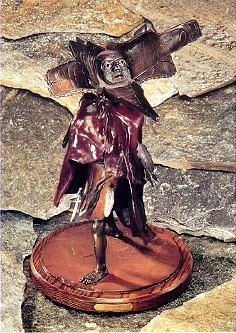 This intricate bronze depicts a Kwagiulth dancer wearing a three way Raven transformation mask, one of many traditional masks created by the southern Kwakiutl. 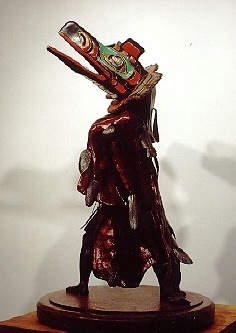 The dancer, hidden in the huge cedar mask, becomes Gwaxwiwe' or 'Raven transforming', and by opening up the hinged face changes from Raven to Killer Whale, and finally into the Human Spirit. In Kwakiutl tradition, respected families gained ownership of particular dances telling stories and legends. Generation after generation, dancers have taken enormous pride in dazzling Potlatch guests with dramatic movements end stunning masks. 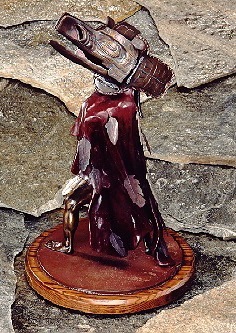 This complex, highly detailed sculpture is the first of its kind: the mask actually opens, just as in the original (see below). The beautiful ceremonial blanket is decorated with cast silver and bronze feathers.